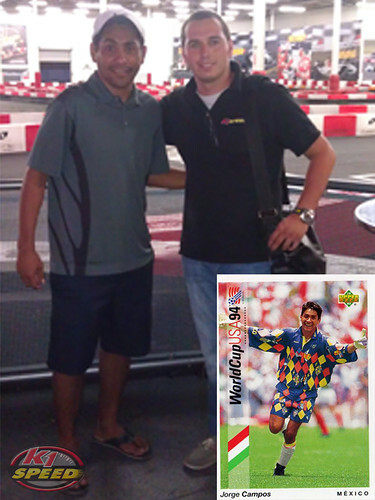 Jorge Campos, pictured here with Patricio Jourdain at K1 Speed Carlsbad, was one of the most notable Mexican players of the 1990s. Campos was a particularly eccentric player, known for his constant play outside the penalty area, his acrobatic style in goal, and his attire. His strength in goal was his leaping ability and speed, which made him able to overcome his relatively low height of 1.68 m (5 ft 6 in). Born in Acapulco, Mexico, Campos also made for an effective striker, an example of rare versatility in football. At times, he would start a game in goal, and transfer upfield later in the match, mostly at the club level. His trademark, self-designed bright kits contributed to his popularity. On the international stage, Campos started for Mexico in the 1994 and 1998 World Cups as the first choice goalkeeper, and went on to collect 130 caps for his country. At the 1999 New Year’s Cup in Hong Kong, in which Mexico was invited as well as Egypt and Bulgaria, Campos’ father was kidnapped back home and Campos returned to Mexico to attend to the matter. Campos was invited several times to play with the Rest of the World Team against clubs like Real Madrid, Barcelona, and Milan. His last game with Mexico was in 2004 when they played a friendly against Tecos.